Demand from all-in-one PCs combined with requirements for lower power consumption and a thinner, smaller storage alternative to existing 3.5-inch hard disc drives (HDD) will help create a viable market for 2.5-inch HDDs in desktops beginning next year. 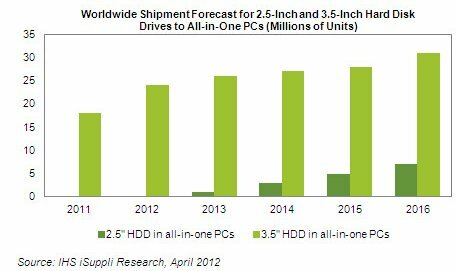 Worldwide shipments of 2.5-inch HDDs to all-in-one PCs are forecast to reach approximately 1 million units in 2013, up from virtually zero this year, according to an IHS iSuppli Storage Space Market Brief from information and analytics provider IHS (NYSE: IHS). Shipments then will increase to 3 million units the following year and rise steadily until they hit some 7 million units in 2016, as shown in the figure below. The HDD market for all-in-one PCs will continue to be dominated by 3.5-inch discs, with shipments by 2016 estimated at 31 million units, but growth will be much slower for the segment during the same period than for 2.5-inch drives. The 2.5-inch HDD is used widely today in a variety of products, including mobile or notebook PCs, external hard disk drives and in enterprise applications such as servers and storage systems. Their advantages over conventional 3.5-inch HDDs include a smaller form factor, lower power consumption and higher endurance. Of late, however, the 2.5-inch drives have also become attractive and desirable for desktop PCs, especially among all-in-one computers. With demand for all-in-one desktop PCs expected to grow, future market prospects for the 2.5-inch HDD appear encouraging, IHS believes. Compared to conventional desktop PCs, all-in-ones possess superior features and performance, brought about by advances in microprocessors and the thinner HDD size. As such, all-in-one desktop PCs can extend the markets for 2.5-inch HDDs beyond their current areas in notebooks, external hard drives and the enterprise, allowing the thinner and smaller drives to penetrate the desktop space. Two disadvantages of the 2.5-inch HDD are speed and price. Most 2.5-inch drives typically run at 5,400 revolutions per minute (rpm), compared to 7,200 rpm for the 3.5-inch. The 2.5-inch also sells at slightly higher prices than the 3.5-inch as a whole, although the gap in price can be narrowed if 2.5-inch volumes become significant. Nonetheless, enough positive factors are present to push growth overall for 2.5-inch drives. As a result, the 2.5-inch will represent approximately 4 percent of the all-in-one desktop PC market by next year, and then go on to account for 18 percent of the all-in-one market by 2016. And as capacity and speed continue to improve and costs go down, the 2.5-inch HDD is expected to take share away from 3.5-inch HDDs in the traditional desktop PC market, IHS predicts. “The 2.5-inch hard drive market may enjoy about four to five years of uninterrupted growth before low-priced, high-density solid state drives become more competitive,” Zhang said.